I was once told that if you have something important to say to a busy person, the first step is to practice getting your main points across in two minutes or less. That way, the theory goes, if you happen to find yourself, say, in an elevator with the President, you won't waste the opportunity stumbling over your words. And if you're really good, the President will then reply, "Tell me more." Anyway, that was sort of the mission when I traveled to Santa Monica to make a series of 18 short parenting videos for Kids In The House. And even while I doubt I'll ever find myself alone on an elevator with the President, I found it an excellent exercise to try to talk about big topics in a limited time-frame without it coming out as word salad. A huge part of this blog is about the whys and wherefores of a play-based curriculum, so I know I can go long on the topic. 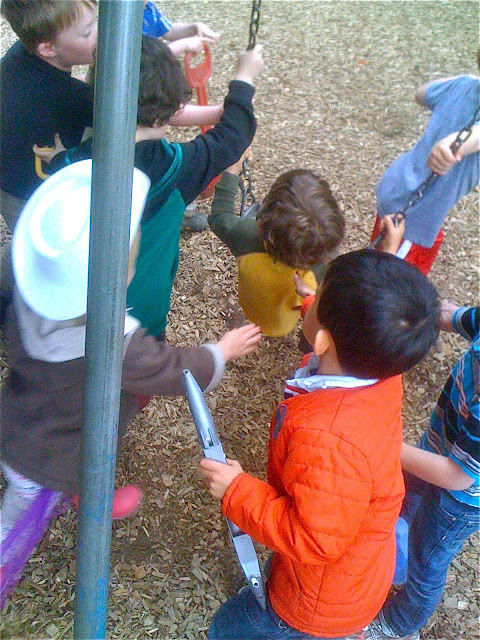 Embedded below is my attempt at an elevator ride speech on how a play-based curriculum works. And if you liked the video, you can find not only the rest of my videos (search for "Tom Hobson"), but also some 8000 more two minute parenting videos at Kids In The House.